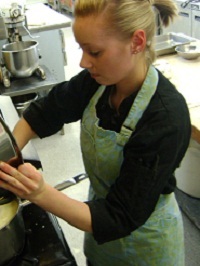 Amanda was one of the contestants with the highest number of votes in the ChefUniforms.com Cash for the Holidays Contest, and is February’s Chef of the Month! Below is a short interview with Amanda about her experiences in the contest and her career thus far, followed by a recipe that she submitted. Bon Appétit! I created a page on Facebook with the link and information for the contest and sent it out to all my friends and family. I also updated my status on Facebook everyday with the link reminding people to vote and pass it on. Family members also shared my link and my Grandparents e-mailed their whole address books to help me get votes. I also had co-workers vote for me and they passed it on as well. I wanted to become a chef because I have always loved to be in the kitchen. Ever since I was little I loved baking for my family or helping my mom make dinner. I love the women’s pants! I bought my first few pairs 3 yrs ago when I graduated from college. And I am still wearing the same ones today, so I am very happy about winning the gift certificate because I could use some new ones! Yes I do, my boyfriend and I love to check out new restaurants in the area. We also live close to NYC so sometimes we will plan a trip to head into the city and just go from restaurant to restaurant. I have noticed at the restaurant I work at that when I make a dessert special, the homey more rustic desserts will sell rather than the more intricate ones. I think this is because of the hard economic times we are living in. People find comfort in the more homey desserts because it reminds them of a better time perhaps. I hope to one day open my own place, but with the economy the way it is, nothing is going to happen soon. No, I don’t think so. I like where I am at in this stage of my career. Take every opportunity that is offered to you while in school; absorb as much information as you can because it will help you once in the industry. If you can, work while you’re in school, I did and was able to take what I learned in school and use it at work. Some of my friends did not work while in school and were very nervous about their first job out of school and even just trailing at a restaurant. A part-time job will help boost your confidence and your skill level. 9. Would you please send us a recipe (either a favorite food or one you made up) to post for our readers? This is a recipe I make at Nisi (the Greek restaurant I am the pastry chef at). 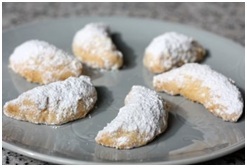 They are Greek cookies called Kourabiedes which have roasted almonds and are coated in powdered sugar. They are very popular! 1. Roast Almonds (whole with skins) till they are golden brown inside, set aside to cool. 2. Cream butter and sugar until light and fluffy. 3. Add the vanilla and brandy to the creamed butter mixture. 4. Add the flour and baking powder gradually, mix until incorporated. 5. Chop almonds into large chunks once they are cool and add to the mixture. 6. Shape dough into crescent shapes, bake in a 325*F oven for about 12 min. 7. Allow cookies to cool a little then sift powdered sugar on top, once the cookies are completely cool cover them in powdered sugar (firmly press the sugar on top of the cookies). Store in an air tight container. ← Bake for Family Fun!